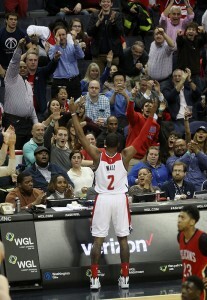 When you put two of the top players in the NBA on the court in one night, someone has to shine, well neither John Wall or Anthony Davis did that, but some how Wall managed to turn his horrible start into something nice. Wall was 5 for 17 from the field in his second triple-double of the season and fifth of his career. He also had two steals in 31 1/2 minutes. Davis grabbed 20 more rebounds, but was held to just nine points on 3-for-9 shooting. The All-Star forward had 59 points and 20 rebounds in a 111-106 victory against the Pistons on Sunday. The big stat of the night for the Wizards was the start of Jared Dudley, who hit on 6 of his first 7 three point attempts to give the Wizards a comfortable margin heading into the second half. Jrue Holiday had 20 points and seven assists for New Orleans, which had won four of five to remain on the fringe of the Western Conference playoff hunt. Ryan Anderson scored 16 points on 7-for-11 shooting. Leading 54-51, the Wizards opened the third quarter with a 14-0 run. Dudley hit a 3-pointer, fed Gortat for a layup and nailed another 3 from the wing on consecutive trips.